While spring may be on the brain, it’s still FREEZING and leaving the house without a coat is impossible. Thankfully, teddy coats have been all the rage this winter, making layering up a little easier! I love that a cute teddy coat can take you from winter into the chillier days of spring. There are so many cute options available right now too! 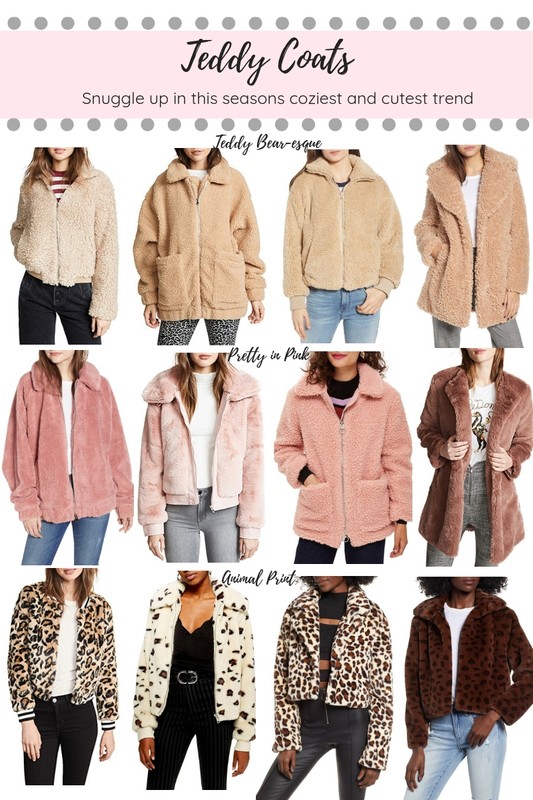 Check out 12 teddy coats I am loving below! It’s officially December, which means I will be sharing gift guides on a weekly basis! As a self proclaimed homebody, my favorite gifts to give and receive are always of the cozy variety. Pieces for lounging around, snuggly winter favorites or items to enhance that cozy glow at home are always at the top of my list! Rounding up some of my favorite cozy gift ideas for her today. To shop my cozy gifts, just click any product photo. You can also scroll below the collage to check out some more of my cozy gift ideas! I will be updating this, so make sure to check back! It’s a bit late, but I’m finally sharing September’s Top 10! I’m not sure how I forgot this post as I love sharing what you guys are loving! Lots of sweaters and layering pieces this month in anticipation of the the colder weather to come! This cozy cardigan was one of my favorite finds last month! It comes in 3 great colors and is currently on sale for under $20! I paired it with shorts (this AGOLDE pair will forever be my favorites!) early in the month, but have been pairing it with jeans and booties and over dresses as the weather has cooled off! 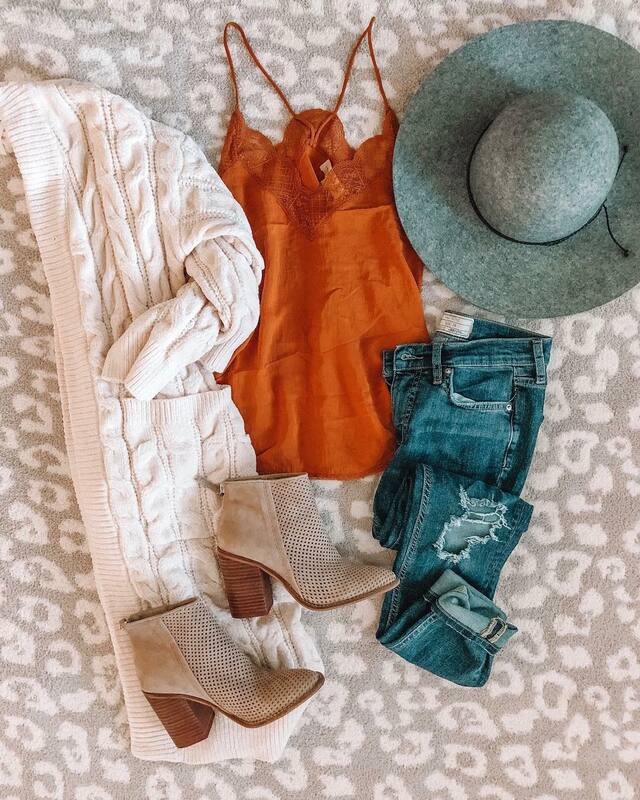 Nobody does a fall sweater like Free People! This option was one of my favorites last year and I love that they brought it back in even more color options this year! The great thing about this piece is that it can be worn with jeans or worn as a sweater dress! I love pairing it with over the knee boots for a chic fall look! 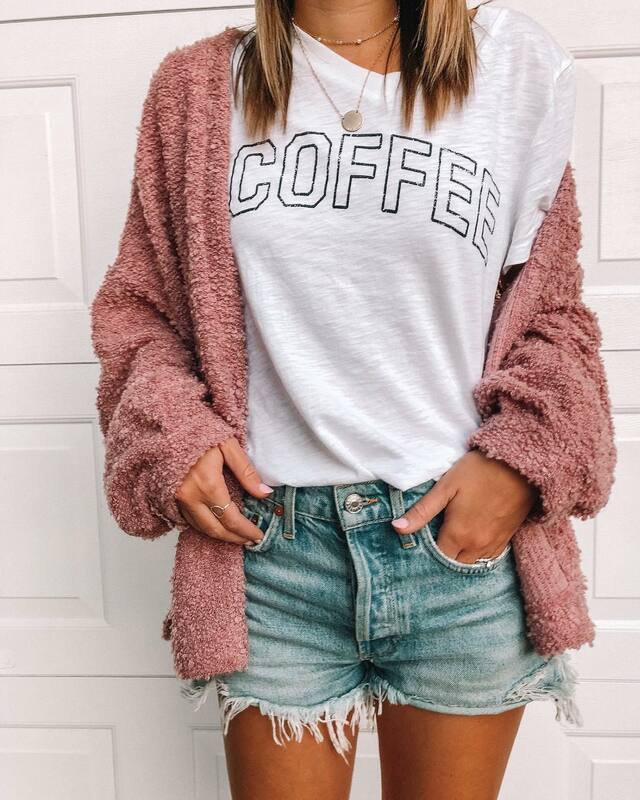 This sweater is such a steal at under $40! It comes in a few color options and is such a cozy piece! I was drawn to the orange because it’s such a fun color for fall! How cute does this color look paired with leopard boots? Leopard has been one of my favorite trends this fall…but really, isn’t leopard a neutral? This sweater has been coming in and out of stock and it’s no wonder why! It’s such a great fall piece! 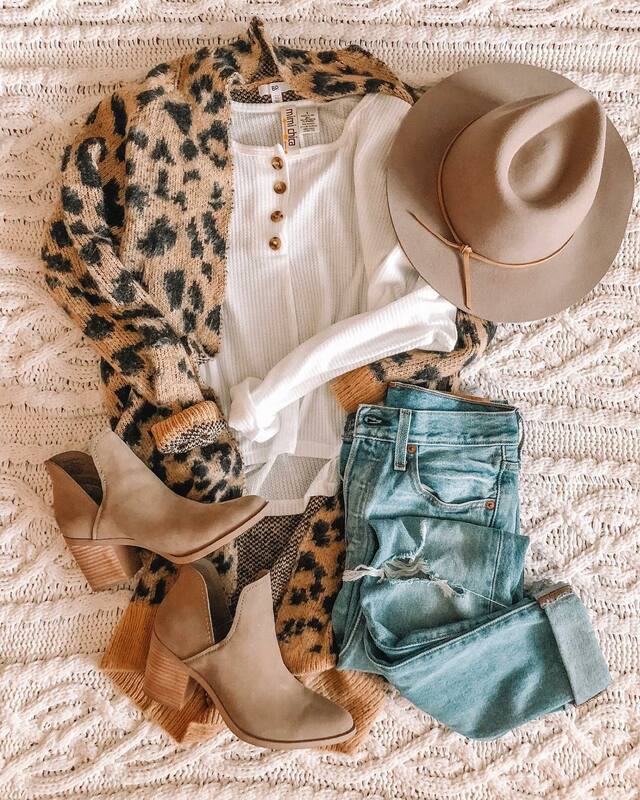 Check out more leopard sweater options here. A chenille sweater might be at the top of my fall must have list. There is nothing cozier! This cardigan is SO soft and I love the neutral color. It goes with anything and everything! A pretty lace tank top is a great closet staple. This option is currently sold out in this color, but comes in a ton of other great color choices! These jeans are my current favorite! They are so comfortable and have just the right amount of stretch and distressing! The best part? The price tag won’t break the bank! This oversized camo sweatshirt was one of my favorites last year and I was excited to see it back in stock this fall. Camouflage is another trend I am loving this fall and a camouflage sweatshirt is a great low-key way to incorporate this trend into your wardrobe! This sweater is the ultimate fall sweater! 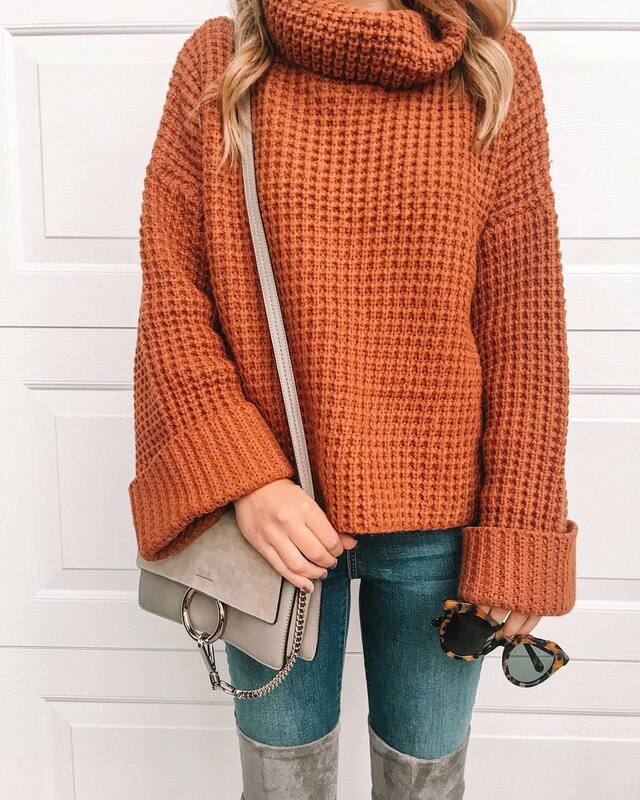 I love the color, the oversized turtleneck and the chunky rib knit. By far the most popular item from September, this midi cardi is a must have. I love the longer length and the stripes!